3/31/2009Share this story on Facebook! 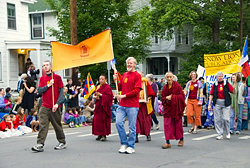 Monks from the Namgyal Monastary lead the 2008 Ithaca Festival parade. 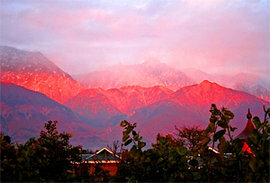 This summer, the Namgyal Monastery Institute of Buddhist Studies offers students and the Ithaca community the opportunity to travel to Dharamsala, India, to experience Tibetan life and culture in exile. For three weeks, participants will connect with the exiled Tibetan community, learn from the Tibetan Dalai Lama, and experience Buddhism from the perspective of Tibetan monks. There is even a chance that the group will speak to the Dalai Lama himself. The trip is coordinated by IC assistant professor of theater arts Lindsay Gilmour and Venerable Tenzin Thutop of His Holiness the Dalai Lama's Namgyal Monastery. The Namgyal Monastery, located in downtown Ithaca, is the North American Seat of the Dalai Lama. Those going on the trip will face the realities of the Tibetan exile through meetings with government officials, refugees, and students of the Tibetan Children's Village. Gilmour received her master's degree from Columbia University's School of International and Public Affairs with a focus in Tibetan studies and conflict resolution. She worked previously in the Tibetan exile community at Dharmashala, India; at the Tibetan Center for Conflict Resolution; and at Gu Chu Sum, an association for ex-political prisoners.